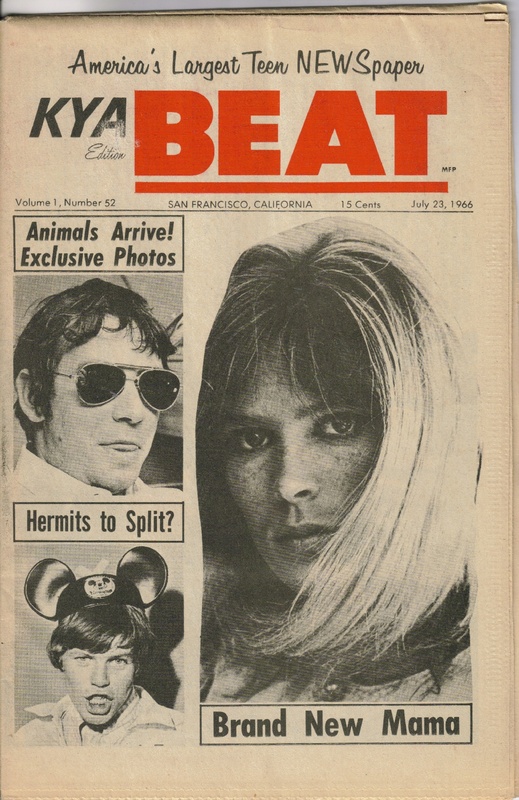 This is the cover and an article from the July 23, 1966 edition of the San Fransisco KYA Beat. In it, there are details about how Michelle is no longer a member of the Mamas & the Papas. I'm not sure what the copyright laws are on such an old article, but I'm going to type it out anyway, and hopefully I won't be sued! The spelling error on "isn't" in the second paragraph is intentional as that is the way the magazine published it. As reported in the July 9 issue of The BEAT, Michelle Gilliam is officially out of the Mama's and Papa's. While Papa Denny took care of the heart-throb department for the female fans, the small, lithsome, lovely Michelle soothed the eyes of the male fans. No reason was given for Michelle's departure at the peak of the group's newly-found popularity. But a reason really isn's needed. She's gone - and that's all there is. There is a new Mama now but the group vehemently denies that she is a replacement for Michelle. They prefer to think of her as "just a new Mama." Her name is Jill Gibson and she is 22 years old. She is Jan Berry's girlfriend and has been friends with the Mama's and Papa's for the last seven years, so it was almost natural that she should eventually join the group. "If they weren't recording they would still be singing. These are four fantastic, individual people who love to sing and really enjoy their singing. We would never have looked for a replacement for Michelle. Jill is joining only because she happened to fit in and if she hadn't been there the group probably would have gone on as three. They wouldn't have gone out and tried to replace Michelle." Lou describes the new Mama as a "very artistic and aesthentic person. She paints and she loves flowers. She knows every flower there is to know. Beauty is the most important thing of all to her." Besides singing, Jill is also a talented songwriter, having written several hit songs for Jan and Dean. Should be interesting to see if she will collaborate with Papa John on some new songs for the group. The group is currently preparing to begin a series of recording sessions for their second album, an album which will contain Jill's voice instead of Michelle's. However, the nation will not get a glimpse of the new Mama until August when the group undertakes an extensive cross-country tour. Following the tour, the group will begin filming a television special for Fall viewing. Jill has already become an integral member of the group,k and just as she has been accepted by her fellow Mama's and Papa's, we hope she will be accepted by their many fans.